I don’t generally recommend camping out, alone, two states away from home, in the yard of someone you met online. No, generally, I would say that sounds like a bad idea. But . . . that’s what I did last summer. 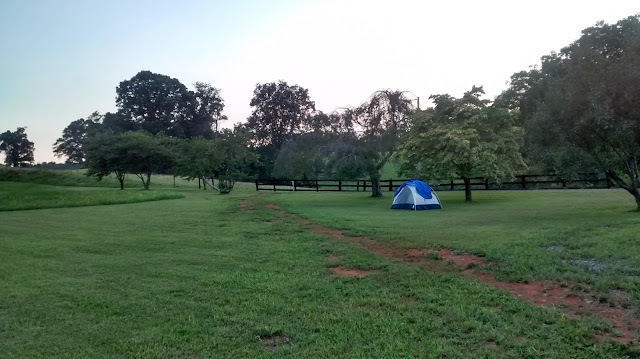 I practiced pitching my tent, then packed it along with a sleeping bag, my journal and a couple of pieces of writing and drove far into the winding hills of southern Virginia. Last summer I attended my first ever writing retreat mostly because it was inexpensive and being hosted by a woman whose kind and caring nature was palpable in her online presence. Camping made the whole trip more affordable and I booked my stay after confirming I’d be able to catch a shower and a good dose of caffeine each morning in the main house. It felt like a big adventure and it was. This past weekend I packed up again. 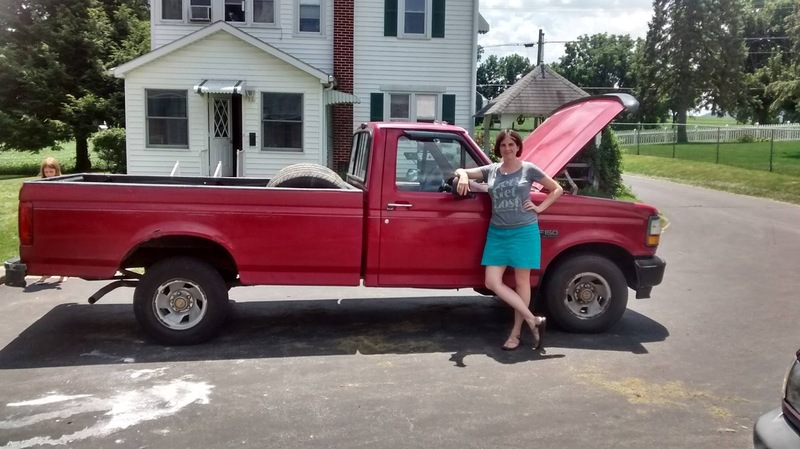 My husband topped off the fluids in his old Ford pickup truck. He seemed confident I would make it there and back. I felt a breakdown was likely, if not imminent. I headed south on Rt 81 without A.C. and, except for stalling out a time or two, arrived without incident. When you're accustomed to living your life tethered to others, day in and day out, as I am, it's good to cut yourself loose sometimes. Despite the sweat dripping in the 90+ degree heat, I felt pretty cool, rattling along in that little red truck. I don't have words yet to describe the weekend, except to say it was good, so good, for my soul. When I got home, my kids were flesh-hungry for me, climbing and hanging from my limbs. I threw down my things and dove into the dirty kitchen, the dirty kids, the empty refrigerator. In the evening John hitched a small wagon to the back of the lawn tractor and pulled it, full of kids, through the lawn. I roamed the yard gathering yellow tennis balls from the green grass, then hid behind the house waiting for the tractor to whiz around the corner. When it came, I lunged, letting loose a loud viking roar and a volley of balls aimed at the kids whose mouths hung open in delight at the sight of their roaring, running mama. They screamed. I screamed. And we played the scene over and over until I was again dripping wet with sweat. Yes, my friends, it's good to cut yourself loose sometimes. I loved reading this post as it breathes "Brave!". And yet it is in those brave moments that we discover something refreshing and awakening about our God. So much fun! I love camping, but I've never tried it alone. But I have to admit, that solitary time sounds like it would be very good for the soul! Kelly, I'm so glad you were able to get away and have time for yourself and your writing. Praying that you continue to see the fruit of this retreat in your life. I have never camped before but have always wanted to. Sometimes it is so important to give ourselves some time and space. I'm glad you had a restful trip. I love this!!!!! Just love it and reminds me that we all...ALL...need to be kids once in a while!! You have given me a smile tonight! Kelly, good job taking care of yourself and getting away. I'm sure the fruit of your retreat will be percolating for a while-I look forward to hearing about it.